Huascaran National Park is an area of exceptional natural beauty because of its number of high snow-capped peaks, its glaciers and its high-altitude plateau. The National Park is located in the Cordillera Blanca range of the Andes. It is the highest tropical mountain range in the world. The park measures ca. 154x30 km. It includes El Huascaran, at 6786 meters the highest mountain in Peru. And 26 other peaks over 6000m in altitude. There are 30 glaciers and 120 glacial lakes. The park has a wide range of vegetation, including the gigantic Puya raimondi. Spectacled bear, puma, deer, vicuna, hawk and condor are among its fauna. There is some volcanic activity, the last earthquake was in 1970. 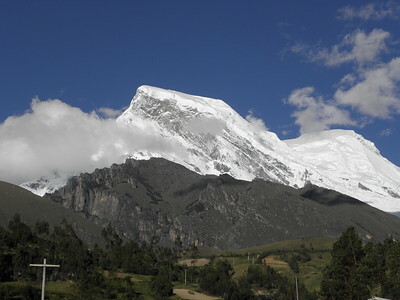 Huascaran is a popular area for hikers. The regional centre of Huaraz is well geared to serve them, and it is a pleasant place to stay for a couple of days. I encountered many Swiss travelers here - mysteriously attracted to a landscape that is quite similar to that in their home country. Huascaran's forte clearly is the beauty of its snowcapped peaks. 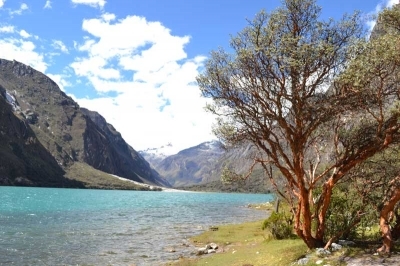 For a non-walker, the easiest way to see the National Park is to take a tour from Huaraz to the Lagunas Llanganuco. These kind of tours are conducted daily. Like other organized day tours that I have taken in Peru, they try to take in too much in a too short time span. The guides only speak Spanish but are pretty knowledgeable. The Huascaran peak was hidden behind clouds for the first part of our tour. There are supposedly great vistas from the towns in the valley below. One of these towns is Yungay, for ever connected to the mountain after an earthquake and a consequential avalanche destroyed the village in 1970. They now have turned the location of the former village into a impressive place of remembrance. After several stops in the valley, we finally reached the first of the Lagunas Llanganuco. It's a pretty turquoise glacier lake. There are some short walks in the area that let you come close to the plant life here. The lake is partly surrounded by the typical Polylepis Forest. Animal life is much more scarce. On our way back the clouds finally left, and we had good views of the Huascaran and the surrounding peaks. There's another WHS closeby, Chavin. En route from Huaraz to Chavin you will pass a different part of Huascaran National Park. The views of the snowcapped mountains are not so great here, but it shows the high altitude plateau really well. And there's a great blue lake here too, Lago Querococha. I visited this beautiful national park in June 2012. LC Peru operates daily flights from Lima to Huaraz, the perfect location to explore the park and “nearby” Chavín. I wish I could write about a several days hike through the park, but we also took the lazy way in and visited Lagunas Llanganuco. We did not book a tour but went for public transport instead. From Huaraz we took a public bus to Yungay. Taxis are waiting at Yungay bus station to bring you to the lagunas and back. The lagunas provide stunning views of Peru’s highest mountain and an overall very beautiful scenery. We walked around the lake to do at least a bit of hiking. But I’m sure this area would deserve a much more serious hike. Like most visitors, we also passed through a different part of the park when driving to Chavín. This high plateau looked like a random Swiss mountain area over the timberline. Still beautiful, but nowhere close the beauty of the Llangnuco region. Peru may be known for its cultural World Heritage Sites, but the first site I chose to see upon arriving in country this past October was a natural site: Huascarán National Park. Within hours of landing in Lima, I was on a bus to the lovely small mountain town of Huaraz, and the next day I took the same type of tour as Els to the Lagunas Llanganucos. The mountain scenery was spectacular, and I had an early preview of the park's snow-covered peaks from the breakfast lounge on the top floor of my hotel. Up close on the tour, the mountains were just as impressive, and greener than I expected on the approach to the lakes. Only the lower lake was accessible for the tour, but we had one and a half hours to explore. I opted for a boat tour, then hiked on the walking trails around the lakeshore, in the shadow of Huascarán, the highest peak in Peru. I was hoping to see more Andean wildlife than I saw on my visit to Sangay National Park in Ecuador, but alas, my scorecard stood at: Animals not seen -- spectacled bears, pumas, vicuñas, condors; Animals seen -- ducks and two alpacas hiding amidst the trees. As for flora, even though I didn't see the Queen of the Andes bromeliad on the tour, I did appreciate the Polylepis forest around the lake. I also appreciated the particularly amenable weather, which was very welcome after my misty visit to Sangay. This was a beautiful site! Logistics: Huascarán National Park can be visited via bus tours, or via private transportation; as Els mentioned, tours to Chavin from Huaraz will pass through another section of the park that is further south than the lakes. Again, I am delighted to be the first to review this wonderful WHS. Huascaran NP is a truly beautiful place. I doubt there is anywhere else on Earth where you can so easily access such enormous mountains. The hiking here is truly wonderful, and hugely varied. I have spent several days walking to glaciers, lakes and valleys. I cannot recommend this site highly enough. I am lucky enough to be writing this at a charming place called 'The Lazy Dog Inn', which is on the border of the park. From here, some of the most beautiful and least visited parts of the park are easily visited. I highly recommend walks into 'Quebrada Llaca' and 'Quebrada Cojup' (excuse any spelling). Entry fees are a very reasonable $2 per day or about $25 for a month pass. Glaciers: Said to contain 663 glaciers of which 27 above 6000 mtrs! Women Explorers: The lower N summit was first climbed in 1908 by Annie Smith Peck (Possibly the only mountain worldwide to have first been climbed by a woman?). Fatal Accidents or 'disasters': The Ancash Earthquake May 31 1970. Most of the destroyed towns were outside the inscribed park but "Fifteen members of a Czech expedition were climbing Huascarán at the time, and were among the thousands dead." Named after individual people: It is often suggested that Huascaran is named after the Inca emperor Huascar. But this is disputed: its original name was Huascan, which would mean "attractive" or "tempting". 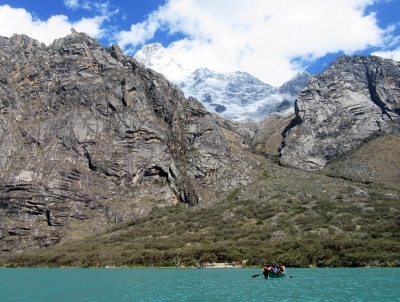 Tourist Treks: Several multi-day treks, such as the Santa Cruz or the Huayhuash treks.